In his thirty-plus years as a companion to the dying, Frank Ostaseski has sat on the precipice of death with more than a thousand people. He has distilled the lessons gleaned into The Five Invitations. will, if lived, show us how death can be the guide we need to wake up fully to our lives. I think of these as five bottomless practices that can be continually explored and deepened. They have little value as theories. To be understood, they have to be lived into and realized through action. They can be understood as best practices for anyone coping with loss or navigating any sort of transition or crisis. I am reminded that death, like love, is intimate, and that intimacy is the condition of the deepest learning. Life and death are a package deal. They cannot be pulled apart and we cannot truly live unless we are aware of death.The Five Invitations is an exhilarating meditation on the meaning of life and how maintaining an ever-present consciousness of death can bring us closer to our truest selves. As a renowned teacher of compassionate caregiving and the cofounder of the Zen Hospice Project, Frank Ostaseski has sat on the precipice of death with more than a thousand people. InThe Five Invitations, he distills the lessons gleaned over the course of his career, offering an evocative and stirring guide that points to a radical path to transformation. These Five Invitations show us how to wake up fully to our lives. They can be understood as best practices for anyone coping with loss or navigating any sort of transition or crisis; they guide us toward appreciating lifes preciousness. 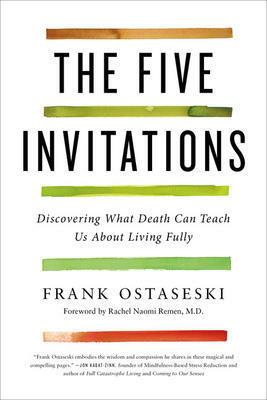 Awareness of death can be a valuable companion on the road to living well, forging a rich and meaningful life, and letting go of regret.The Five Invitations is a powerful and inspiring exploration of the essential wisdom dying has to impart to all of us.